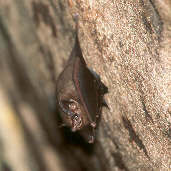 The Amazonian Sac-winged Bat was discovered by Thomas in 1901. Today it lives in Brazil, Para, Santarem. It is currently (2003) listed as a vulnerable species. Very few reportings of this particular bat species have been uncovered. It is from the Emballonuridae family of bats, which are Sheath-tailed bats. It is thought to inhabit the Amazonian River drainage system. The attachment of the wing membranes to the metatarsals distinguishes this from other species from the same family Saccopteryx. E-mail to add your Amazonian Sac-winged Bat related website.